thank you so much....can i see the results what you get for both images.. Image 1.png may have motion blur at 45 degrees (upper left to bottom right), but I get a blur amount of 20 px. It is really hard to tell in that image, since there are other distortions showing that are causing larger peaks. I used ImageJ to measure the angle (45 deg) and blur=0.5*(length of the distance between the two tiny dots on opposite sides of the center)=20. I used ImageJ to measure the angle and length of the blur between the two tiny dots on opposite sides of the center. I have not tried to unblur it, since I was not sure it has only motion blur. I can try tomorrow. It is late for me tonight. There may be other distortions that are more significant than motion blur. How did you create the motion blurred image? What was your original input image before blurring? Do you know what algorithm that tool uses? this is the original image..
i don't know what is the algorithm is running..but i have given the parameters are motion length in pixels and angle(direction) of motion to blur the image. I then used my fftconvol script to blur it. I then use the same PSF image with an estimated noise of 0.0001 to deblur it. I do not think Lunapic is using a proper camera type motion blur (simple straight line PSF), but a motion blur effect similar to that in Imagemagick. See http://www.imagemagick.org/Usage/blur/#motion-blur. Note the shape of the blur is like a comet (only one side is blurred). which show too many peaks and not clearly motion blur. thank you so much for your big support..
again i am getting a big doubt. 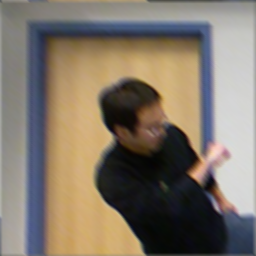 For example, i am having a blurry image(motion blur) from the real world as a input, whereas i am not having the original image(clear image of that). now i want to deblur it. what i have to do? 1. because you are having original rgb_000354.png image. then you are adding motion blur with PSF. 2.then your are estimating the noise. 3.then you are retrieving the original image with the PSF information what you have already known. i am having a blurry image(motion blur) with no information about its blurness. how can i estimate the blur kernel(PSF) and how can i deblur it? so if i want to deblur the image, whether i should add the motion blur to it. You can use the cepstrum concept as mentioned above. But if the blur is not "uniform constant linear motion blur", then it won't show a result that will clearly tell you the unique arguments of distance and angle. This failure typically occurs in real images when the motion is not the uniform over the whole image, not the a constant direction or not a constant speed (such a accelerated or jerky motion). So you need to have a very ideal type of motion blur for the ceptstrum to detect it. Otherwise, I have no suggestions. 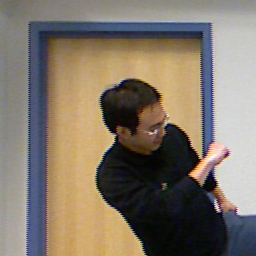 Your person kicking is not uniform constant linear motion blur, because it occurs only for the leg, not over the whole image and is not constant in direction or speed. To have any hope of deblurring, you would have to crop the part of the image that has the motion. So an image that might work would be one for which the camera is moving at constant speed (not rotating) which is hard to do with a hand-held camera. Or some thing like a car moving in a straight line at constant speed horizontal to the camera. You could then crop the car and possibly deconvolve it using the cepstrum to measure the arguments. Blind deconvolution may reduce some blurs, but it usually only works for psf that when transformed to the frequency domain are non-negative. 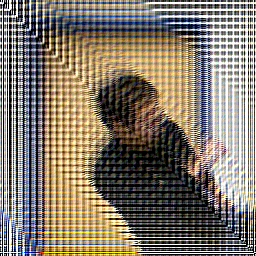 Motion blur and defocus psf have oscillations in the frequency domain and so blind deconvolution does not work well. Blind deconvolution works more typically for astronomical atmospheric blur which is more gaussian shaped in the frequency domain. Unfortunately, I have no blind deconvolution functions, but they won't typically work for motion or defocus. If you want to provide an real example of an image that had motion blur. I can try to run the cepstrum on it and deblur it. But again, it needs to be a more or less ideal motion blur as defined above. 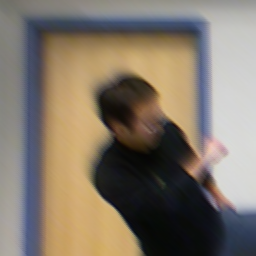 One other way to determine motion blur is to find some point object in the scene (such as a corner) and measure its blur distance and angle in the blurred image. whether wiener filter, Lucy method and blind deconvolution methods are required a unblurred image to help restore the blurred image?